In an era of high-efficiency gas furnaces, most buyers have a hard time finding the best furnace that will meet comfort needs and save thousands of dollars in operations. Here are 6 top technology trends in the high efficiency gas furnace segment that a buyer should look out for in a furnace for sale. Hybrid high-efficiency gas furnaces are available in only selected sales showrooms in Canada. Like the hybrid cars, these gas furnaces can operate on more than one source of heat. During the cold winters, the furnaces for sale in the hybrid category run without any visible maintenance issues. In addition to excellent temperature regulation, they save at least 50% on energy consumption, smartly switching from the traditional gas/oil furnace to electrical or solar-driven furnace. Depending on the temperature required, the hybrid systems in gas furnaces for sale can easily replace all traditional HVAC units. Most traditional gas furnaces fail to heat or cool the entire house uniformly. The Variable-Speed Temperature Control technology ensures that every corner of the house has a consistent ambient temperature. The thermostat-regulated heater and blower fan out the hot air into the room at different speeds with efficient distribution and humidity control regulations. Variable speed technology in the furnaces for sale is genuinely associated with low energy bills and long operation cycles. Furnaces with this technology last longer than traditional HVAC units. Only single-stage Gas furnaces are available in sales sections from HVAC contractors Toronto. The single-stage burners are cheaper and efficient only for small houses, where the temperature may not vary too much. For bigger homes, the 2-stage burners are recommended as they automate the entire process of temperature control, with multiple heating options and noise-free operations. Noisy furnaces are no longer acceptable in Toronto. High noise levels take away the comfort delivered by the heating furnaces. Muffled operation technology used in latest HVAC appliances cut away the noise by at least 80%. Most traditional furnaces run at 80 decibels and more. Buyers looking out for furnaces for sale from HVAC contractors should assess the noise levels. Top HVAC manufactures offer 100% noise-free furnaces that have patented noise control and vibration reduction technologies. For homely comfort, a high-efficiency gas furnace is required to maintain the ambient humidity at 40-60 percent. The system controls not just the temperature and the humidity levels, but also regulates the blow speed at which the hot air is delivered. The variable speed technology works in tandem with the humidity system that commands the direction, quality and the blow speed of output air. In order to maintain the quality of the blow air, the buyers should check out if the HVAC contractor in Toronto deals in furnaces with odor control systems. The technology reduces the foul, damp smell that often accompanies traditional furnace systems. 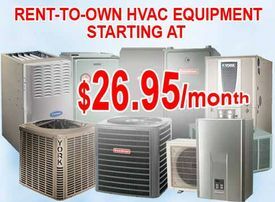 HVAC contractors in Toronto offer extensive services in sales, installation and maintenance.